The Southern Islets consist of 5 medium and some smaller islands located in the south of The Island. It has a dense network of rivers, or rather: channels between individual islets, hosting many creatures attracted to water or living in it, though largest waterborne predators can be found closer to the deep waters on South or East. The rivers often have lots of high-end predators, such as Spinosaurs, Raptors, Carnos, and even Rexes. Alpha Carnos and Raptors are also common here. However, these predators are easy to deal with for anyone with a rifle for there are many cliffs to stand on where they can't reach you. There are a few small mountains with metal and crystal on them, and harvesting all of the rocks should yield about 200-400 metal and 10-20 crystal, making it decent for the easy location that they are at. Many forests mean plentiful wood and thatch, and there is never a shortage of Dodos on the beach. Food should be no problem as there are many creatures and easy access to irrigation. Resources are also in abundance, other than crystal and obsidian. Pelt is somewhat hard to get as well. However, a flyer with decent weight and stamina should solve all of these problems. They form the main part of the south-eastern border to the sea. A small, separated island can be seen South-East from the Southern Islets - it's the South Haven. Attempts to swim directly to the South Haven without a Wooden Raft are doomed to fail without a very high Stamina, to say nothing of the threat of aquatic predators such as the Megalodon. To the west is the Footpaw, across a deep river that tends to have Megalodons and Mantas. To the east is Drayo's Cove and the Ocean, and to the north is the Writhing Swamps, and a short distance farther north than that is the Redwoods. 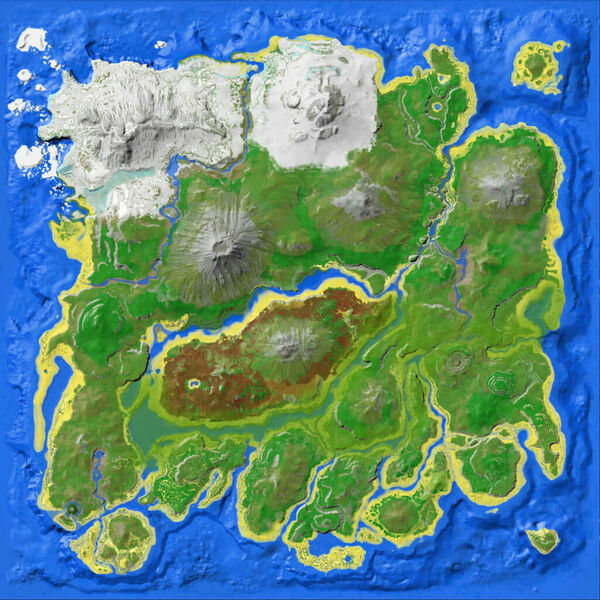 Southern shores of the Islets make an excellent starting location for new players, though going deeper in land will require better equipment. The lagoon in the southwest of this region is frequented only by pairs of Dilos and Compys, as far as predators are concerned. The lagoon itself boasts a large number of Coelacanths, with smaller numbers of Piranha patrolling the waters around the small island located at the mouth of the lagoon to the east. There is a small island at approximately 84,59 with a large rock structure in the center, with a small passage going through. To the east of that rock is another large rock in which a brontosaurus always spawns next to and frequently gets stuck in. After aggravating it, you will have approximately 5 seconds to damage it before it breaks free. The rock cannot be mined. While stuck the head of the brontosaurus is showing with a small portion of the neck and upper body showing. While tempting, building a base right against the rivers runs the risk of Spinosaurus attacks and you should consider bases being a little further away to mitigate the risk. An Alpha T-Rex spawns just north of the easternmost S2 spawn point, at approximately 80,57. It tends to remain active on the hillside and beach along the western shore of the river that flows south from the eastern Writhing Swamps.The opposing shore of this river is patrolled by Raptors. Castoroides are common at the mouth of this river. The large rock formation at the southernmost peninsula is favored as a highly defensible area with few passages that large dinos can enter, and tall rock spires that are wide enough to build a sizable base upon. While building such a base may be quite resource-intensive to properly wall off, it still offers plenty of protection on its own. There are some areas in these rock formations that provide the home buff, so find and memorize these hidey-holes and if you're running from something you can stay in these for the night. There are many cliffs to stand on and shoot predators from beside the rivers, and therefore they shouldn't be too hard to deal with. If you wish to make a base by the rivers, you must make sure the area is cleared first. The climate here is always very mild. At night, however, the water can cause you to be hypothermic, and the forests in daytime are usually around 90 Fahrenheit, and are therefore relatively hot. However, a water jar or two should easily solve that problem, and as for the water, just don't swim at night. There is actually a surprising amount of metal in this region. There are two small mountains, one to the southwest area, and one bordering the swamps in the middle-north region. Harvesting both could very easily yield 800-1000 metal. However, crystal is lacking and obsidian is non-existent if you don't want to go in caves. Small sea creatures like Mantas or Ichthys may occasionally get stuck in the lagoon, but Piranhas might kill these creatures if you try to tame them. This page was last edited on 25 March 2019, at 14:20.